When we got pregnant with our first baby, I was a private piano teacher making approximately $26,000/ year (before taxes) and he was a full time graduate student. Then, I landed a luxurious public school teaching job that was a slight pay increase with health insurance. Sugar momma + baby daddy. By the time we were pregnant with our 3rd, my husband had a job that paid him a salary!! Living large. But, in order to pay off all that aforementioned student loan debt, we’re living on quite a bit less than we make. Sugar daddy + baby momma. All that to say, when I say it is possible to spend very little on a baby, I am speaking from experience 😉 times 3. times 4. Update: we had baby #4. This all still holds true… you just don’t need that much and you can definitely do it on the cheap!! 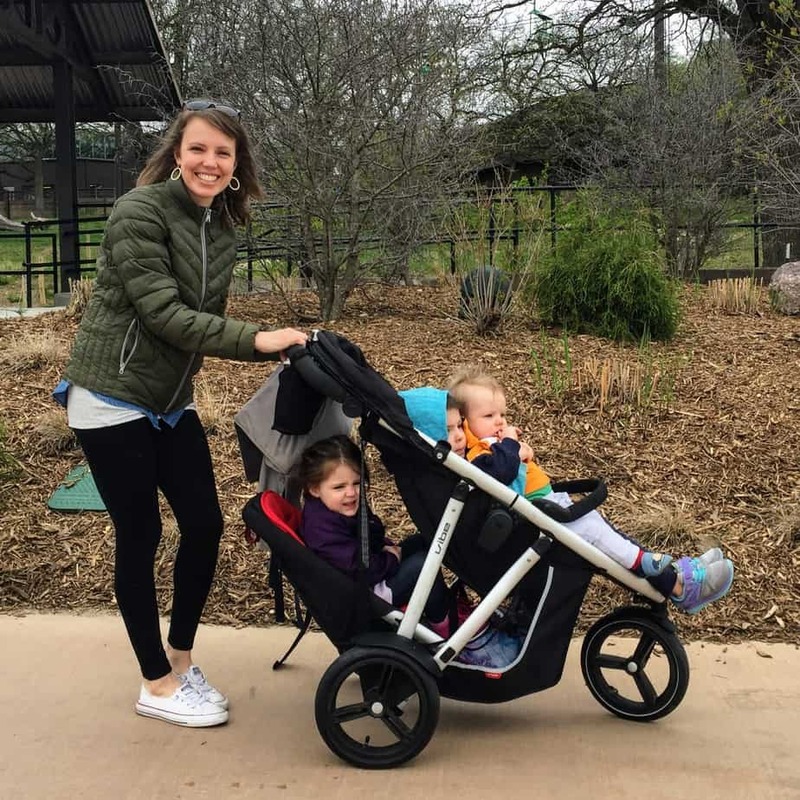 There are of course, some non-negotiable costs to having a baby: diapers, wipes, carseat, maternity and pediatric medical copays, an insurance deductible, some clothes, a bed. Really, you don’t need that much! And, you can definitely figure out how much it costs to have a baby and plan ahead financially! So, how much does it cost to have a baby? What do I really need? And how do I budget for it? 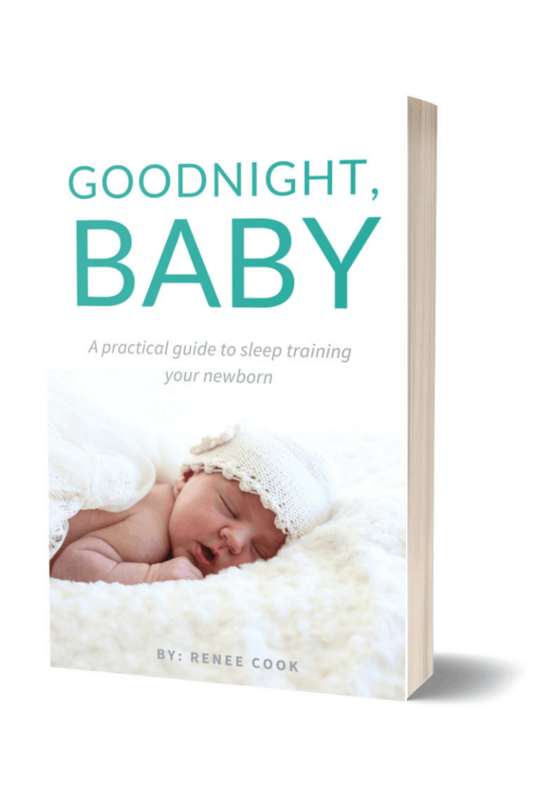 I wrote a very detailed post about baby products you’ll need or want for the first year or so: a complete minimalist baby registry guide. There are a few non-necessities on the list, but not very many! We’ve become kid stuff minimalists, so my baby registry guide only includes things I would buy if we were having our first baby all over again. The important part is to have a plan and make a budget that is within reach for you. List every item with the price; divide the total by the number of months you have to save. This screen shot is taken from my budgeting for baby spreadsheet that’s available to you for free! There are recommended items organized by category with a low end and high end price you could pay. Then there are spots for you to estimate your actual budget, and the spreadsheet will add it all up for you and divide by the amount of time you have to save up! 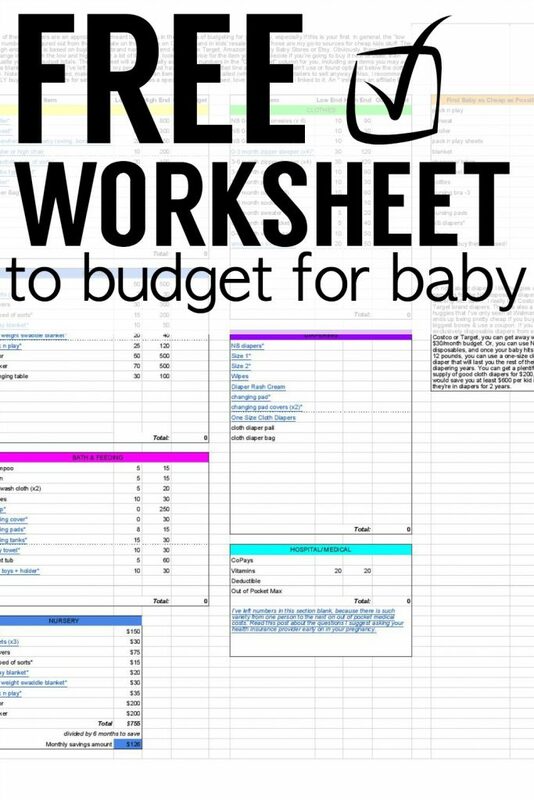 Grab the Budgeting for Baby Spreadsheet! This is actually the strategy for every single thing you might ever need to save up for. This type of savings fund is sometimes called a sinking fund, and I’ve written more about it here. Know you’ll need to replace your car in 2 years? $10,000 new car in 24 months = $417/ month. Want to do a kitchen remodel next year? $12,000/12 months = $1,000/ month. 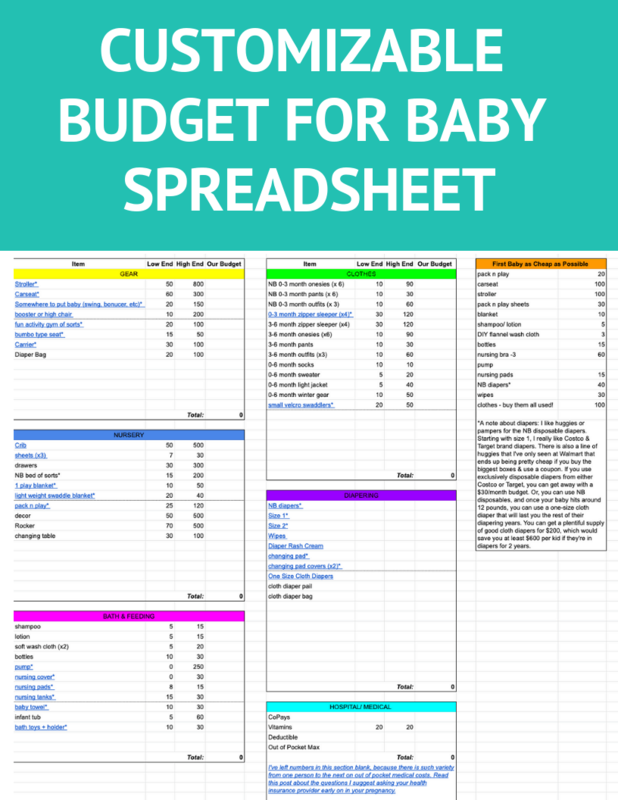 Like the true budgeting nerd I am, I made a Google sheet that you can download and use for free to help you with your planning and budgeting for baby. Click the button below and I’ll send it to you! This budgeting guide includes recommended items in every category, low and high end price points, and a spot for you to enter your own prices. It will even add up the totals for you. 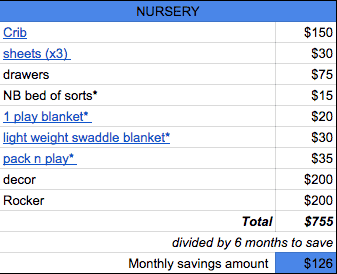 Here’s an example snapshot of the recommended baby gear budgeting section from the spreadsheet. You will see more detailed instructions and tips about how to use this spreadsheet when you open it. 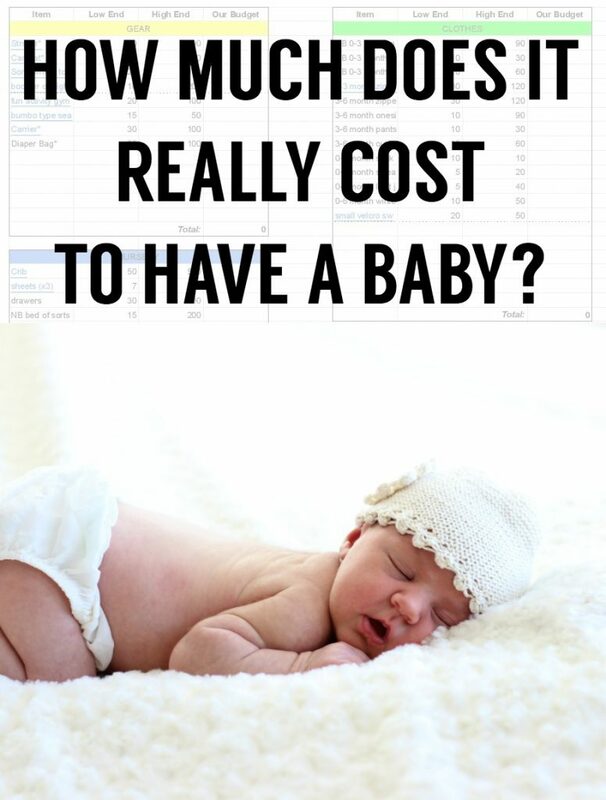 Hope you find this budgeting for baby spreadsheet helpful. If this IS helpful for you, please share on Facebook or Pinterest! You can even choose “tried it” on Pinterest and upload a picture or comment of how it worked for you. THANK YOU for sharing!! This was very helpful. Thanks, Renee! START BUDGETING FOR BABY RIGHT NOW! 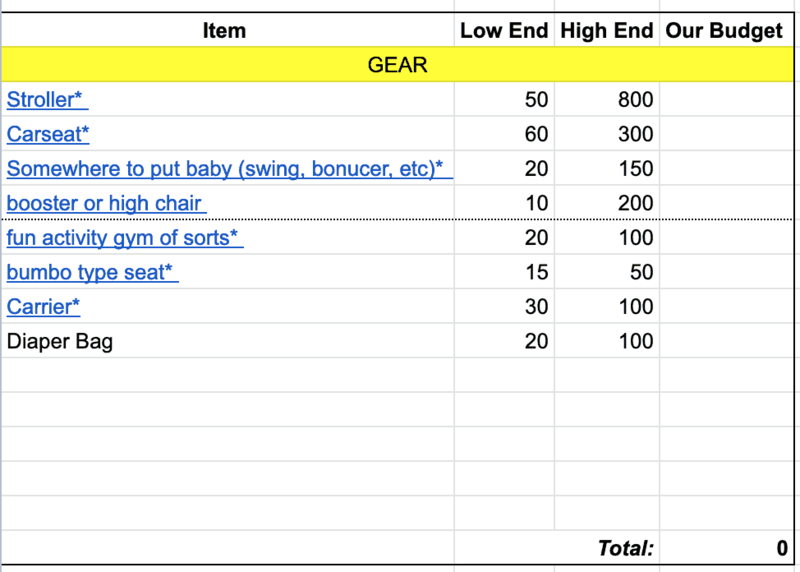 This completely customizable spreadsheet includes recommended baby items in every category, low and high end price points, and a spot for you to enter your own prices. It'll even add up the totals for you.